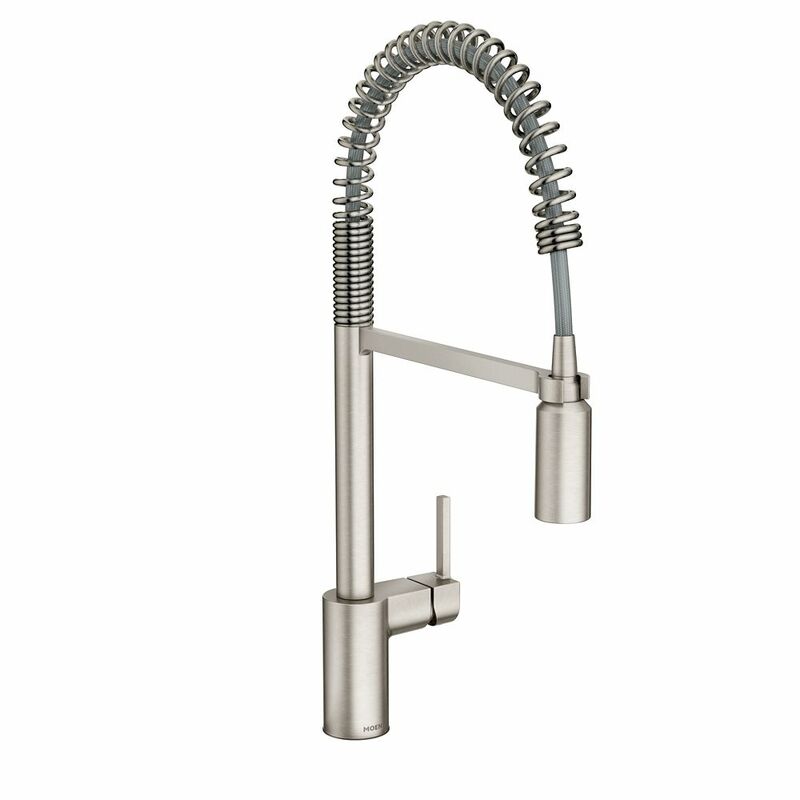 Align Spot Resist Stainless Single-Handle Pre-Rinse Spring Pulldown Kitchen Faucet From intimate galley kitchens to large gourmet workstations, Align faucets bring a refreshed, modern look to your home. Simple lines create the contemporary style, while a pulldown wand delivers in-demand functionality. Align Spot Resist Stainless Single-Handle Pre-Rinse Spring Pulldown Kitchen Faucet is rated 4.4 out of 5 by 26. Rated 5 out of 5 by RJM from Expensive but what you get at this price is way superior to lower priced options we found. Defin... Expensive but what you get at this price is way superior to lower priced options we found. Definitely love it! Rated 4 out of 5 by John from I like the style and function but faucet drips some.... I like the style and function but faucet drips some. Rated 5 out of 5 by Brianne from Looks great and operates perfectly! ... Looks great and operates perfectly! Rated 4 out of 5 by Lionel from Moen is the only "pull down" prewash faucet that actually... Moen is the only "pull down" prewash faucet that actually pulls down, the others are just the spring flexing. I liked the style of Kohler, but no pull down.Could have had better mounting, steel plate will rust over time and the threaded tube is anodized aluminum, not brass. Rated 5 out of 5 by Charlotte from Great facet for anyone looking for a contemporary look to... Great facet for anyone looking for a contemporary look to their kitchen. The pull down feature for spraying purposes is a real plus. much easier to use than the separate sprayer housed in the counter top.